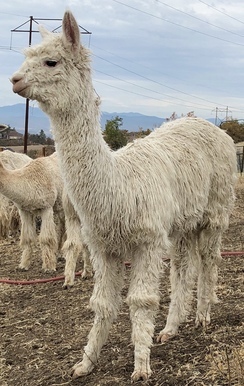 Breeding Quality Champion Suri Alpacas! Chakotah is available to limited outside breedings here at Rogue Suri Alpacas! We Proudly co-own Chakotah with Jude & Al of Pucara International! Tintiy was biopsied in late 2015 and turned out to be one of the best girls on the farm! Which makes sense why her crias always seem to do so well in the show ring! Tintiy's first Cria is everything we had hoped for, a gorgeous image of herself with even better fleece, RGSA Rogue's Pear Blossom! Tintiy's second cria from GLR Nico did not dissapoint! A Gorgeous Full Peruvian True Black female that is perfect, RGSA Claret by Nico! Another beautful girl from Tintiy, this time with Chakotah as the sire! Historically Tintiy has been the best producing female of females on our farm. Year after year she gives us a gorgeous female from a different sire and they do not disppoint. This girl will be no different! We would be happy to find a creative financing option that would fit your situation!